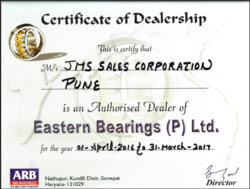 We established in 2007, Jms Sales Corporation is one of the distinguished companies extremely indulged in manufacturer, distributor, wholesaler and retailer an extensive series of products such as Industrial Belt, Jaw Plates, Conveyor Rollers, Industrial Gearbox and many more. To satisfy our customers in most effective way, we are offering these products in many sizes and designs. Apart from this, one can avail these products from us at leading market price within given period of time. We are distributors for ARB BEARINGS LTD , CONTITECH BELTS AND PULLEYS and also we have our own brand MOLY GEL IN LUBRICANTS. Furthermore, we work under the leadership of our mentor Mr. Raj Sawhney. His zeal and brilliant managerial skills towards attaining the firm’s objectives within the deadline have enabled us to muster a large number of loyal patrons in our patrons. We have attained a strong hold in this competitive market due to our capability of presenting a wide series of products. Being a quality-centric entity, our prime aim is to satisfy our customers by providing them durable products. Owing to our ethical commercial practices, we have been capable to create a huge client base across the country. The vital factors for which we have earned vast appreciation from our customers all across the nation include. We are authorized distributor of Contitech Power Transmission Group. Established in the year 2007, Jms Sales Corporation is leading names in the market indulged in offering best quality products.